You’re used to sensors that tell you how far and how fast, right? 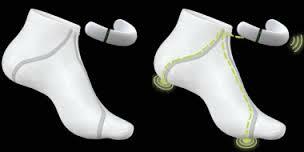 Now there are Smart Socks that will also tell you how well you did it. This Smart Sock is made up of 3 components. The first is a comfy, washable sock, followed by a rechargeable, magnetic anklet that clips onto the sock, and of course, no wearable technology would be complete without an associated app, from which you get to track and monitor all your collected information. Its not the basic information that your Smart Socks can provide you that make them so cool, its the fact that they can track exactly where your foot is falling, and how hard each part of the foot strikes the ground. Information like this can help runners improve performance, prevent injuries, or even simply select the right pair of running shoes. Wearable tech is all the rage, and if you feel as though your fitness program could be enhanced by owning some Sensoria Smart Socks, by all means, head on over to sensoriafitness.com, and pre-order a bundle for around a 199 bucks, and soon you could be running like the wind. Me? I’ll be here on the couch.